Favorite Adoption Story: I have been honored to have been a part of so many adoption journeys and it is hard to choose just one, but here is one of my early favorites. Two months after starting at Nightlight, I was working with a couple that had decided to place their unborn baby because they could not imagine bringing another child into their home. They knew that the two children that they were parenting needed all of them and the baby they were carrying did not deserve to get less attention than she deserved. I showed the couple profiles of waiting families and the birth mom chose a family based on two things: the adoptive father had served in the military and the adoptive mom wore pink cowboy boots on her wedding day! Prior to the baby’s birth, I was at a doctor’s appointment with the couple and the birth mom asked me if I knew the name that the adoptive family had chosen. I told her that I did and asked if she wanted to know the name. After she thought a moment, she confirmed that she did and when I told her, she burst into tears. I had no idea what was wrong, and immediately turned to the birth father who gave me a sign to wait a moment. The birth mom then turned to me and told me that she knew she had chosen the right adoptive family because the name that they had chosen for her daughter, for their daughter, was her grandmother’s name. When the two families met for the first time, it was as if they had known each other for years. The relationship between a birth family and an adoptive family is so special and theirs is a bond like no other. Responsibilities: Katie is the Executive Director of Nightlight’s South Carolina office. She has been with Nightlight since 2013 and has served as the Domestic Program Manager and the Social Services Manager prior to becoming the Executive Director in 2018. 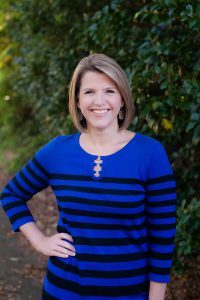 Katie is responsible for the training, supervision, and support of the staff in the South Carolina office as well as providing supervision to our Spanish speaking pregnancy counselor. Katie believes adoption is a beautiful way to build a family, and she is thankful to be part of a team that provides hope and life-affirming options to women and men facing unplanned pregnancies.